This is a tutorial on how to set up a digital download item on your Zencart store. The first step is to set up a "Download" attribute. You can call this anything you want – Digital Download, Digital File, Download File, etc. After logging into your Zen Cart admin, mouse over the word Catalog and go down to Option Name Manager. This is where you will set up the NAME of your attribute. 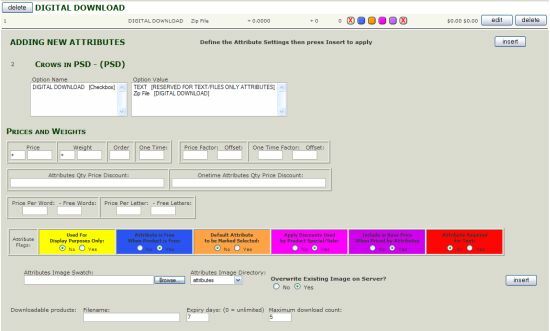 As you can see from the image above, I have already set up a Digital Download attribute. I did this by typing DIGITAL DOWNLOAD in the box under Option Name. I then changed the default setting under Options type to Checkbox, then clicked on the Insert button. The next step is to set up a "Value" for this option. If you look above the word Product Options, you will see a button entitled option values. Click that button. Alternatively, if you are not in the above screen, you will need to mouse over the word Catalog and go down to Option Value Manager. To setup the value, simply choose the option name you need the value added to – in this example, it is DIGITAL DOWNLOAD. In the box under Option Value, type in what you want the name to be – in this case we are using Zip File. Next, click on the insert button. The next step is to upload all the .zip files to the server. These files MUST be put in the /store/downloads folder. To do this, one must have FTP access to their server, or be able to log into their hosting account and upload the files from their hosting control panel. Once the files are uploaded, we are ready to move on to the last step. The first thing to do is to select the Category by clicking on the dropdown box under CATAGORIES. Once you select the category, the items will drop down in the box below. Highlight the product you wish to add the attribute to, then click on the display button. It the ADDING NEW ATTRIBUTES Option Name box, click on DIGITAL DOWNLOAD, and in the Option Value box, click on Zip File. Go down to the orange box that says "Default Attribute to be marked Selected?" and click the Yes box. Go down to the box that says Downloadable products and enter the filename that you have uploaded into your DOWNLOADS folder – eg: dogs.zip. If you would like, change how many days the customer has to download the file (Expiry Days) and the maximum times they can download the file. The click on the insert button. Congratulations! You have now added a digital download attribute to your item!